If you’re like me, you probably initially found the idea that Aaron Suduiko wrote about in “Breath of the Wild: The Hero Who Never Was”—the idea that the player controls a Link-like automaton as opposed to Link himself (what I’ll call “automaton theory”)—to be both implausible and not terribly useful in analyzing the game’s story as a whole. Upon first read, I was tempted to think of his theory as orthogonal to the story of the game. When considering the moment-to-moment interactions with characters and places in the game about the theme of redemption for failures of the past that are so frequent and important in Breath of The Wild, the idea that my avatar might actually be an automaton resembling Link seemed to be a non-sequitur to me. It seemed similar to the thought people sometimes have that everything around us might be a dream or simulation because we have no direct way of knowing that other people are conscious like we are: the idea is vivid and impossible to refute, but not especially useful. 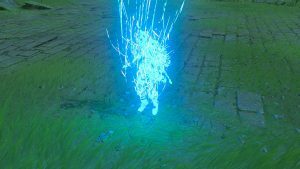 Suduiko claims that aspects of Breath of the Wild’s story and world—aspects such as the avatar’s fast-travel ability, shown here—are best explained by the thesis that the avatar is an automaton built to resemble Link, rather than Link himself. Even without a solid argument in refutation to Suduiko’s theory, I was tempted to reject it outright for this reason alone. I wanted instead to return to a theory that is easier to swallow: that Link is truly revived at the start of Breath of the Wild. I felt, at least initially, that this theory would better enable me to engage with the game moment-to-moment—to think about and tackle the themes and dialogue presented to me. But my concerns ended up being unfounded. It turns out that Suduiko’s theory actually ends up being a valuable way of analyzing the themes and discrete moments of Breath of the Wild, in large part because the game is constructed in a way that makes the revival theory seem obviously true. It is the invitation to the player to assume that Link really was revived that gives automaton theory its punch and poignance from moment to moment in the story. In this way, the two theories end up being thrown into conversation with one another throughout the game. When considering both revival theory and automaton theory in tandem, we can see Breath of Wild as an elegant exploration of ancestral responsibility, a complicated issue that is infrequently handled with much aplomb by most stories. To show why this is the case, I will analyze the themes in Breath of the Wild that arise from both automaton theory and revival theory. First, I will more precisely define the two theories and the nature of the tension between the two. Second, I will demonstrate that each theory, considered independently of the other, highlights distinct, major themes in the game’s story. Finally, I will describe how my favored view—that the avatar appears to be a revived Link, but in reality is an automaton—can bring out some of the more subtle, poignant aspects of ancestral responsibility in Breath of the Wild. Suduiko’s automaton theory also accounts of all of the conversational data explained by automaton theory, as well as the other aspects listed above. If the avatar is an automaton created by the Sheikah, it would make sense that he’d be able to use Sheikah technology to teleport between key pieces of Sheikah technology. Since he is not the Link who is the hero from the past, he’d also be missing the triforce of courage. And the discrete memory retrieval is explained if you consider the possibility that part of the creation of the automaton is the implantation of certain memories into the automaton’s database, along with some mechanism for retrieval. Suduiko explains why the automaton theory accounts for all the conversational data by considering some of the backstory for the Sheikah. He argues that the Sheikah built the revival chamber to create an automaton, not to revive a person; however, since the details of how the chamber works have been lost to history, the characters in the game do not know its true nature. Thus the characters speak of the revival of Link not because it’s what actually happened, but rather because they think that Link was revived. In this way, the fact that characters in the game refer to Link’s revival as fact is explained by automaton theory. So, unless an explanation is given for how revival theory can in fact explain the three other non-conversational aspects of the game listed above, we should reject revival theory in favor of automaton theory, because automaton theory better accommodates and explains the entirety of the game’s story and world than revival theory does. Not only is it entirely possible that the avatar forgot, but it’s also entirely possible that he was not alive 100 years ago. Despite the fact that, on balance, automaton theory is better supported than revival theory, the game makes it very easy to fall for the illusion that the revival theory is actually true. In the end though, as Suduiko points out, the two theories cannot both be true. If it is true that the avatar really is Link, then it cannot be true that the avatar is an automaton that merely resembles Link. And if the avatar is an automaton that resembles Link, it cannot be true that the avatar really is Link. Even though the game is more holistically explained by the idea that the player controls a Link automaton, the fact that the game makes the player and others think the automaton is really Link and treat him as such ends up being of crucial importance to the themes of the game. For those readers who have trouble letting go of the revival theory entirely: fret not, for it is of great importance in understanding the ultimate impact of the automaton theory. Revival theory is something that a player must contend with even if she believes automaton theory to be entirely correct. So let’s consider revival theory and the themes of the game that arise if you subscribe to this theory, since these themes will be of importance in understanding the themes that arise from automaton theory. Assuming for the moment that revival theory is correct, a central fact of the game for the player to contend with is that Link and Zelda failed to save Hyrule 100 years ago, and Link is at least somewhat responsible for that failure (even though one could potentially argue that it was mostly Zelda’s fault). 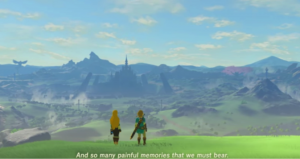 In this case, the resulting themes of the game end up involving the attempt to atone for one’s past mistakes, and nostalgia for a world that has been lost through destruction by Ganon and the inevitable passage of time. By rising up against Ganon and defeating him, the player not only saves Hyrule and all its people, but also redeems himself, Zelda, and their fellow warriors who felt they had failed Hyrule. Breath of the Wild is full of moments of accepting responsibility for failures of the past. In contrast, the automaton theory leaves the player with a very different set of themes to contend with. Since the Link-like automaton (“auto Link,” for short) literally is not the same agent as the Link from 100 years ago (“past Link,” for short), he is not in any way responsible for the actions that past Link took. 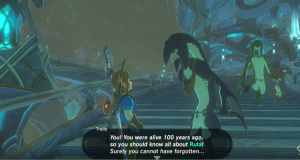 So, for example, when auto Link arrives in the Zora domain and talks to the Zoras about times long past—friendships and fun times, a romance between past Link and a Zora princess, and past Link’s failing of said Zora princess that led to her death—auto Link truly has no connection to those times. He cannot remember the fun times because he never experienced them. He cannot feel that love because he never interacted with the Zora princess. And, most importantly, auto Link is not responsible for the Zora princess’ death because he did not exist at the time of her death. But still he must contend with being told about memories he does not have, and being saddled with blame he does not deserve. The hardest part of this scene for me was the uncanny feeling that the avatar should be feeling something that he doesn’t actually feel. You may notice that auto Link’s predicament closely mirrors the player’s here. The player, like auto Link, never experienced nor took part in the events described to her by the Zoras. Personally, I was a little peeved at the crotchety old Zoras who would accuse me of being responsible for events over which I had no control as a player. In response, I got fired up: I wanted to prove to all of the Zoras that I am in fact the hero and I could still save the day, in spite of their doubt in me. And I don’t consider myself unique in this response. Any player who contends with the Zora’s doubts and rises above them to save Hyrule has proven himself or herself a hero in the face of adversity. This is a major theme of the game that arises if you take the automaton theory to be a fact of the game: proving oneself to be the hero. So it seems as though there are two discrete options to choose between when thinking about the larger themes of Breath of the Wild. Either you could think revival theory is true, and then the game ends up being about responsibility and nostalgia; or, on the other hand, you could think automaton theory is true, and the game ends up being about proving oneself in the face of adversity. These are both powerful themes in and of themselves. But you may not be satisfied with the idea that you have to choose one of these two themes—I’m certainly not. It’s a good thing, then, that the full picture is not so black-and-white. Those who endorse automaton theory still need to make sense of the fact that everyone in the game—including the player—is led to instead believe revival theory. Those who endorse revival theory must contend with the fact that there is a crucial disconnect between the Link of 100 years ago and the present Link—namely, that the player has control over the current Link, but not the Link from 100 years past. In this way, the two theories are always in conversation with one another, and so analyzing the themes of Breath of the Wild according to one theory while remaining agnostic to the other theory does not suffice for the purpose of analyzing the game’s themes as a whole. What we need to do, then, is to consider what themes of the game arise when automaton theory is correct (because it’s better supported by the game than revival theory), but the world is also set up in a way that creates the illusion that revival theory is correct. This leaves the player in a bizarre situation. Since auto Link is an automaton, he is not responsible for the failures of the real Link of the past. But, since every entity in the game believes revival theory, auto Link is always taken to be responsible for the failures of the past. This creates a tension in the game, making it unclear for many players whether or not they, as the decider of their avatar’s actions, are obligated to accept responsibility for the events of 100 years ago. And, given the open-world nature of the game, it is entirely possible for the player to flaunt that responsibility and do whatever they feel like in the world instead. But it is also possible to accept the mantle of responsibility and save Hyrule. I contend that this tension of whether or not to accept responsibility for the people of the past is one of Breath of the Wild’s most potent themes. What the game’s comment on this theme is will become clear when we consider an idea about ancestry. Every person has a long lineage of people who lived before them and allowed for their existence. 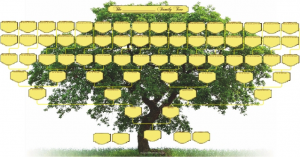 We all have a family tree. If you haven’t already done so, I suggest taking the time to learn about yours. And not only have these people given us capacity to live and breathe: they have given us our genetic code that (to a large degree) determines how we think and behave. So we as individuals have a complicated relationship with our ancestors. We are definitely not responsible for their actions, because we did not even exist while they made their various choices. But, simultaneously, we bear the burden of their choices by being a continuation of their legacy. Because we are a member of a family, we inevitably act as a representative of that family. We look and usually act to a certain extent like our ancestors did because of our inheritance of their genetic code. As a representative of our family, we inherit the responsibilities of our ancestors, and the actions we take affect how the family is viewed collectively. We are not responsible for our ancestors’ actions in the past because that we did commit those actions, but we still carry the burden of those actions because we act as representatives of our respective families. This idea is thematically represented in Breath of the Wild when we take the automaton theory to be correct, while also acknowledging that the player and the characters in the game believe that revival theory is correct. The automaton theory argues that auto Link is not responsible for the actions of the original, real Link. Yet even still, the shadow of revival theory lingers, and auto Link is misidentified as his quasi-progenitor and blamed for that person’s actions. 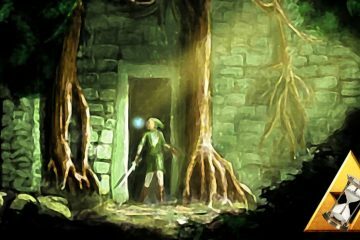 Every character in the game, and likely even the player herself, views the revival theory as correct, and the revival theory argues that the avatar is certainly responsible for Link’s actions. So auto Link is deeply pressured to take responsibility for things he did not do. This leads to the game’s call to action. Auto Link is called to take responsibility for the state of Hyrule and save it. The illusion that auto Link really is responsible for the failures of the past makes this call to action more potent. All of these people are identified as a problem due to their inherent connection to the actions of their ancestors. The difficult question, then, ends up being what to do with the pressures of responsibility that has been inherited in this way. And it turns out that Breath of the Wild uses open-world game design to posit a poignant solution to these feelings. Even after that explanation, though, we’re left with a puzzle: why do I, the player, still feel responsible for the fate of Hyrule even before aggregating Link’s memories (besides the fact that I’m playing a game and hopefully just want to go beat Ganon intrinsically)? The idea of ancestral blame responsibility solves this puzzle. Impulsively, as a player, we see continuity between past Link and our avatar, even if our avatar is an automaton. The player who subscribes to automaton theory likely sees past Link as a pseudo-ancestor of auto Link. In this way, the sins of the father become the sins of the son. The feeling of responsibility is retained, right from the beginning of the game. In the end ,we reach an elegant, simple, and hopefully satisfying conclusion: believing automaton theory does not require doing away with the urgency to act and the sense of responsibility for the fate of Hyrule we may feel. Even at this point, you may have qualms that lead you to reject automaton theory in some way. But those qualms are outside the scope of this piece. My goal has been specifically to show that one initially plausible basis for rejecting automaton theory—i.e. that it has no bearing on the game’s story or themes—doesn’t withstand scrutiny. We have seen that automaton theory and its relation to the illusion of revival theory illuminates the theme of ancestral responsibility, which runs deep throughout Breath of the Wild. From the idea of automaton theory and its relation to the overtly presented revival theory comes a theory of ancestral responsibility and ancestral blame, which speaks in surprising, vivid ways to the experience of being human, as well as to many confusions about identity in relation to ancestry. And along the way, it answers the question that at least I had in the back of my mind as I played the game: “Why am I being blamed for these things that I never did?” Even if not directly responsible for the actions the avatar is being blamed for, the player controls an avatar that acts as a representative for the actions of those that came before him, and for that reason alone there is urgency to rise, take responsibility, and save Hyrule. As a note, I don’t consider this to be an impossible task, but I’ve yet to see an argument that succeeds at doing this. Nathan Randall is a Master’s candidate in game design at FIEA. He analyzes how gameplay mechanics and design impact the storytelling of video games. Learn more here.